Finds at the site include a Roman fort, bathhouse, and aqueduct system. They are probably from the late Roman or Byzantine period—roughly between the third and sixth centuries C.E. The Darby’s excavation site in southern Jordan. What makes the findings even more intriguing is the ancient writings found at the site. The Darbys have been working with an epigrapher—an expert on ancient inscriptions—to learn more about the writing. Robert Darby said the epigraphic remains at the Jordan site, ‘Ayn Gharandal, are quite significant, because it is rare to find writing in bathhouses and small forts from the Roman Near East. “There’s very little in terms of written evidence from these sites,” he said. 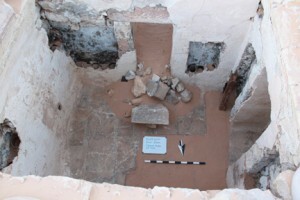 In the bathhouse, the archaeological team found numerous charcoal inscriptions and drawings decorating its walls, essentially ancient Roman graffiti. The fort, however, contained an official painted inscription, possibly a dedication to soldiers stationed at the site. The inscription, painted in ancient Greek using bright red letters, had fallen off a wall and was in pieces. It was sent to the conservation lab at the American Center of Oriental Research in Amman to be put back together. “It’s sort of like piecing back together a puzzle,” Robert Darby said. Several pieces of the puzzle are still missing, and the team likely won’t have a translation of what remains until December. One piece of graffiti from the bathhouse contained an early Christian symbol known as a Chi Rho. The Chi Rho uses the first two letters of the Greek word for Christ to form a cross-like shape. The fort inscription includes a list of names that are Nabataean in origin, which tells the archaeologists that the soldiers stationed there may have been local, not sent from Rome. Some of the individuals are named after Nabataean deities. Combined with the Chi Rho symbol, this suggests that people in the area may have been transitioning from traditional to Christian beliefs. The team has also found a number of pots, tiles, and other objects of daily life at the site. These discoveries tell them much about the lives of the people who lived there. The site has been disturbed in the recent past by looters and also could be completely destroyed by a proposed canal between the Dead Sea and the Red Sea. Erin and Robert Darby will be leading a UT study abroad program to ‘Ayn Gharandal next summer to continue the excavation.